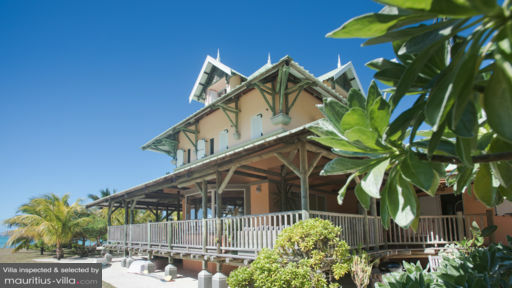 This wonderful villa is located right at the beach of Point D'Esney and is surrounded by a private green garden. You might need to blink your eyes twice before realizing that this charming wooden house, overlooking the turquoise ocean, is going to be your home on this beautiful island. 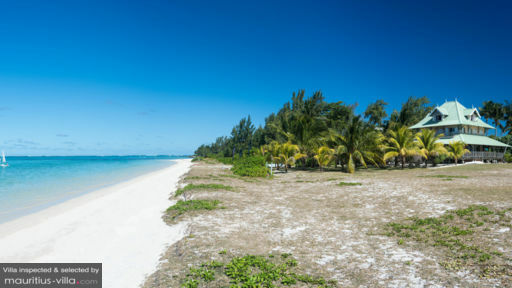 Pointe D’Esny is a peaceful and friendly neighbourhood in Mauritius, a perfect place to unwind and enjoy total tranquillity. However, the centre of Mahebourg, with café's, markets and museums, is just a short drive away and to get to the airport takes about 15 minutes by car. A wooden stairs from the sandy beach, leads up to veranda where you can breathe in the fresh ocean air and gaze at the amazing view while relaxing on the sofa or enjoying drinks at the alfresco dining table. 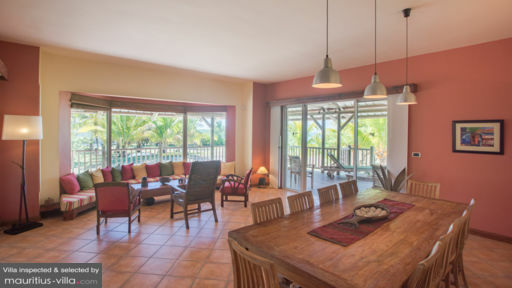 The villa has a cozy and homey feel with wooden furniture and a lots of colourful decorations. The living room features a massive comfy sofa tucked with lots of pillows and there is a teak dining table for precious family time. A TV room is found on the second floor for an evening of entertainment and there is a charming green painted kitchen. The four bedrooms are all equally charming with ocean view and air-conditioned comfort. Each room has a comfy double or twin beds and a private en-suite. The master is found on the top floor and it boasts a large soaking Jacuzzi tub in the en-suite. During your stay you don't have to think about anything. The maid will keep your tropical home spotless. All you have to do is relax, sunbathe on the beach, beneath the tropical swaying palms and swim or snorkel in the sea. Beautiful villa, well arranged, everything was there for us to spend 10 memorable days. We will come back without hesitation, thank you Mauritius villa. Excellent.